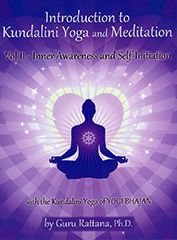 Introduction to Kundalini Yoga and Meditation contains, in its two volumes, everything you need to begin your voyage of self-discovery into the magic of Kundalini Yoga. This second volume - Inner Awareness and Self-Initiation - helps you embrace and enhance your personal journey. Its enlightening exploration of the Ten Bodies and Chakras systems offers a lucid understanding of the physical, mental, emotional, and subtle energic aspects of the awakening process, and shows you how to evolve from ego to soul consciousness.